The aim is to bring experiments, non-conformism and creativity back to the contemporary art. 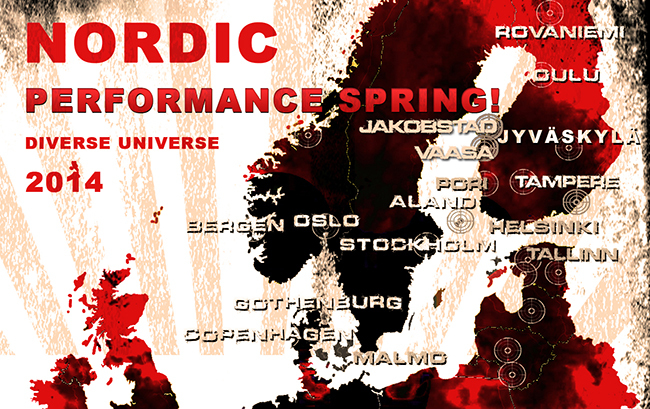 Diverse Universe is a nomadic performance festival, traveling through the East-South-West and North Europe, uniting Performance and Live artists from all-across the World. Copenhagen ✗ Malmö ✗ Gothenburg ✗ Oslo ✗ Bergen ✗ Stockholm ✗ Mariehamn ✗ Pori ✗ Vaasa ✗ Pietarsaari ✗ Oulu ✗ Rovaniemi ✗ Tampere ✗ Jyväskylä ✗ Tallinn ✗ Pärnu ! Performance Art and Performative Actions, Spoken Word, Poetry, Butoh Dance, Sound, Noise, Music, Wild Visuals & Unexpected Results and Even More ! +++ ALL SCHEDULE THERE ! Tartu ✗ Tallinn ✗ Pärnu ✗ Riga ✗ Kaunas ✗ Alytus ✗ Budapest ✗ Belgrad ✗ Sofia ✗ Athens ✗ Ioannina ✗ Marseille ✗ Bilbao ✗ Madrid ✗ Toulouse ✗ Clermont-Ferrand ✗ Riom ✗ Romagnat ✗ Paris ✗ Berlin !